Most two and four-stroke motor oils are formulated to have an affinity to engine component surfaces, acting as a barrier that keeps condensate from contacting engine components and forming corrosion. However, the effectiveness of motor oil in this area diminishes with time. 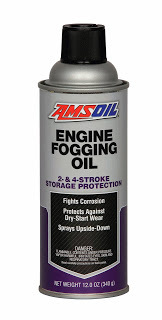 AMSOIL Engine Fogging Oil offers superior film retention, providing long-term protection against corrosion and dry starts, extending engine life and reducing operating expenses. Its aerosol spray formulation offers easy and clean applications, while reaching more components and offering complete distribution of the oil, something especially beneficial in applications with horizontal cylinder orientation, such as outboard motors. Consult equipment owners manual for application directions.